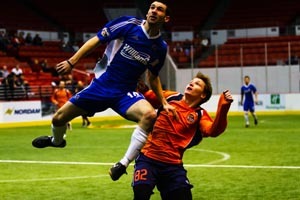 TULSA, OK—Of all their opponents this season in the Professional Arena Soccer League, the Tulsa Revolution (2-12) has played the Wichita B-52’s the most, meeting twice in the Hartmann Arena in Park City, Kansas and on their home pitch in the Cox Business Center once, with all of the matches ending with Wichita on the heavy side of the scoreboard. After last week’s match, the Revolution were riddled with various injuries, most notably to star forward Franck Tayou and Levi Coleman, and they were not in the lineup Friday night as they took on the B-52’s for the fourth and final time this season, and after Wichita’s last visit to Tulsa two weeks ago resulted in the B-52’s winning the match 10-9 in the final minute, head coach Michael Nsien’s team was ripe for some payback. The game turned out to be a streetfight between the Revs and the B-52’s from whistle to whistle. It was a lot more physical than it was in the game two weeks ago, but that made for a lot more conservative game from both teams. Initially, neither team made deep penetrations beyond their opponent’s yellow lines, and while both Wichita and Tulsa had some excellent scoring chances in the first quarter, it wasn’t until the game’s 13th minute did any scoring occur. Michael Poneys scored the first goal for Tulsa at the 11:45 mark of the first quarter, but Wichita responded nearly 30 seconds later when Travis Pittman found the net behind Revolution goalkeeper Lewis Amos. Poneys scored his second goal less than a minute into the second quarter, the Tulsa took a two-goal lead at the two minute mark on a goal by Sam Guernsey. The B-52’s scored two more times to make the score a 3-3 tie at the intermission. The Revolution’s David Parente scored at 9:21 of the third quarter to give the home team a 4-3 lead and then newcomer Alex Tiem buried a Parente rebound behind Wichita goaltender Nic Martinez to once again put Tulsa ahead by two at 5-3 in the third quarter’s 14th minute. Pittman scored about 20 seconds later to narrow the Revs lead to one, but it would be a lead that the home team would not surrender. At the 8:31 mark of the fourth quarter, Poneys chipped the ball across the Wichita goal mouth towards Josh Danza, who half volleyed a one-timer into the B-52’s net to give the Revolution their third and final two-goal lead, and they would hold on for their second win of the season. The Revolution will end the season on the road in Texas. 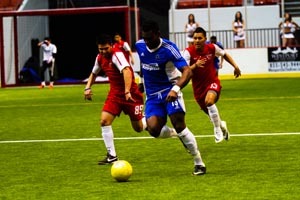 First they will travel on Saturday to Beaumont to face the Texas Strikers, who are the only other team the Revs beat this season and who on Thursday suffered a league-record 26-3 loss to Hidalgo. Then on Sunday afternoon they conclude the 2013-14 PASL season in Hidalgo. This entry was posted in Sports, Uncategorized on February 12, 2014 by admin.